Camera lenses and video lenses are optical devices that attach to video cameras used in machine vision, quality assurance, and remote monitoring applications. They are permanently fixed to video cameras, or used interchangeably with lenses of different focal lengths. There are several basic types of products: aspheric, pinhole, close-up, and wide angle. Aspheric lenses produce large angles of refraction and short focal lengths. Pinhole lenses are small-diameter devices that are designed for insertion into tubes, holes, or other small areas. Pinhole lenses with right-angle bends are called 90° pinholes. Wide angle lenses offer a wide field of view for broad image captures. Other types of camera lenses and video lenses are also available. Optical characteristics for camera lenses and video lenses include focal length, adjustability, focal ratio, minimum focusing distance, zoom capability, zoom magnification, and optical format. There are two types of adjustability: fixed focal length and variable focal length. A video camera’s focal ratio or F-number describes the aperture of the lens as controlled by the iris. F-numbers conform to an international aperture scale in discrete values such as F1, F1.4, F2, F2.8, F4, F4.6, F8, F11, and F16. As a rule, smaller F-numbers indicate larger apertures. Minimum focusing distance and range are measured in English units such as inches (in) or metric units such as millimeters (mm) or centimeters (cm). Optical format is an approximate measure of the diagonal size of the imaging area. Common optical formats for camera lenses and video lenses include 1/7 in., 1/6 in., 1/5 in., 1/4 in., 1/3 in., 1/2 in. 2/3 in., 3/4 in. and 1 in. Camera lenses and video lenses provide iris control, an aperture adjustment mechanism which regulates the amount of light that can pass. There are four basic types of iris control. Fixed iris control does not permit adjustments to account for changes in lighting conditions. Video camera lenses with manual iris control can be adjusted by hand and are designed for stable or consistent lighting conditions. In auto DC drive lenses, the iris is automatically adjusted via a dc signal output by the camera. There is no circuitry in the lens, just the motor driven by the DC signal. For auto video drivesthe iris is automatically adjusted via a video signal output by the camera. Circuitry in the lens itself accepts the video signal, then conditions it into an iris adjustment signal. Camera lenses and video lenses with integral filters, anti-reflective coating, and motorized zoom magnification are commonly available. There are several mounting styles for camera lenses and video lenses. C-mount lenses have a flange-back distance of 17.5 mm and are suitable for both C-mount and CS-mount cameras. CS-mount lenses have a flange-back distance of 12.5 mm and require a 5 mm adapter for use with C-mount cameras. S-mount video camera lenses are designed for devices such as personal computer (PC) cameras and board-mounted cameras. 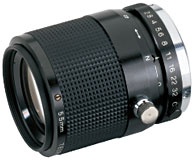 F-mount and K-mount video camera lenses are proprietary, bayonet-style mounting configurations. Camera lenses and video lenses in other mounting styles are also available.